the simplistic to the complex. Very likely the first instruments created by man were percussion pieces, as they require little effort to produce. Anything, really, can be used to create a drum. Related to this, my personal favorite DIY instruments are percussive as they can be so simple and yet used to create incredible rhythmic performances live and in the studio. 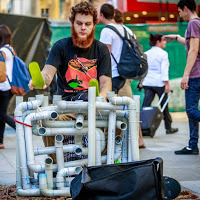 One drumming set up that deserves recognition is the construction-bucket drum sets that are used in cities throughout the world by street musicians. 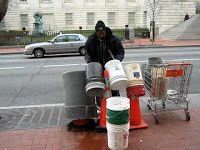 They are used on streets throughout Washington DC in the United States and traditionally have been used by street musicians to play DC “Go-go” beats, a rhythmic music that originated in and is special to that particular city. These drums are made from buckets that originally held paint or plaster and have been tossed from construction sites, coupled with the orange cones used for caution during road repair and construction. Ingeniously, a player mounts two buckets atop the cones by simply draping the metal handles over the top, one on each side for balance, and voila, a drum set. Different sized buckets produce different tones, and often the players use pieces of wood instead of traditional drumsticks in the true DIY spirit. In addition to this set-up, I have also seen “bass drum” accompaniment in which a drummer simply uses an upside down massive plastic trashcan. Generally, shopping carts are used to move the set from location to location. This may seem simple to create, but often the beauty of genius is its simplicity. Furthermore, the beats that the players produce can be top-notch. DIY to its most basic level, simple and awesome, one bucket each. video is the easiest way to understand. wildly impressive. However, Pipe Guy is one-man-show, a true DIY musician. perhaps allow the pipes to reverberate more. and sound designers are inventors. They are designers of material and sound.